The Cairo Jazz Festival gives sample of music education with Jazz4kids workshop held at Darb 1718. During two sessions, on 22 and 23 March, a group of children surrounded Susan Overmeer in the Darb 1718 garden, listening to and engaging in music activity. Overmeer was invited by Amro Salah, Cairo Jazz Festival’s founder and director to participate in this year’s festival with music workshops tailored for children. Born in 1973, Susan Overmeer is a jazz musician, saxophone player and a songwriter, but she prefers to present herself as a “musicologist and music educator.” She explains that she began her work with a series of educational projects which she launched in her home city, Den Haag (The Hague). Since 1997, she started developing her own curriculum, presenting it to children in primary schools. In 2006, Overmeer launched her Jazz4kids project and wrote her own curriculum directing the children and music teachers through the educational elements. Her series of books titled “Jazz in the Classroom” includes songs and activities ideas that can be implemented with children aged 4 to 12. Moreover, together with her band, Overmeer gives interactive jazz concerts at schools throughout the country, visiting children with special needs and organising workshops for children and for music educators. During a two-hour session at Darb 1718, Overmeer gave a sample of her regular work with children. While working on a number of rhythmic elements, she invited the children to explore the sounds of various percussion instruments while allocating a lot of time to free musical expression. Though the workshop might have seemed a bit long, especially for the youngest children, Overmeer’s activities kept all the participants attentive throughout the complete session. The workshop was conducted in English and joined mainly by children aged 5 to 10. They played several games, moving through the consecutive steps of improvisation, starting with simple rhythmic patterns before trying more elaborate improvisation including singing and playing several instruments. “While creating independently many elements, children also interact, listen to each other, musically respond to one another,” Overmeer stresses the importance of team work in Jazz4kids. While doing so Overmeer does not leave the whole music session to a chance. During the workshop at Darb 1718, she based her musical journey with children on a song from her curriculum Jazz4kids. Using the instruments provided by Overmeer, and guided by her, children added their own their own rhythmic explorations to the simple tune, topped with improvised singing. Throughout its 5-year history, the Cairo Jazz Festival always tries to include the youngest audience into the music making process, presenting to them the important artistic riches which they are not offered at their schools. Egypt’s music education relies mostly on activities held by arts centres operating away from regular schools; they are attended by a few children whose homes recognise the importance of music in a child’s development. 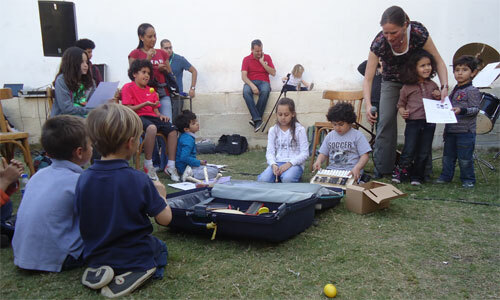 With no doubt, music workshops for children are important additions to the activities held by the Cairo Jazz Festival. The initiative has great potential to develop. Not only would one wish to find more of similar workshops in the upcoming editions of the festival, but hopefully they would be equally addressing children from a wider scope of social classes, for example by reaching to children from lower-middle class families deprived from the luxury of music activities.